（The Asahi, September 25・26, 2016）　Japan will host the Asian Games for the third time in 2026 after Aichi prefecture and its capital Nagoya were confirmed as the venue for the multi-sport event by the Olympic Council of Asia (OCA) on Sunday. Japan, hosts of the 2017 Asian Winter Games, 2019 Rugby World Cup and 2020 Summer Olympics, also staged the Asian Games in Tokyo in 1958 and Hiroshima in 1994. 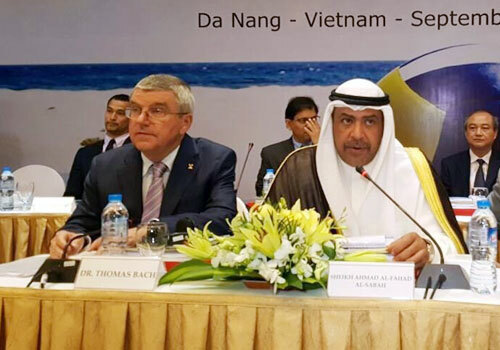 "The road map of our main event is very stable," OCA president Sheikh Ahmad Al Fahad Al Sabah said after the decision of the general assembly in Danang, Vietnam. "Together with our three Asian Games in 2018, 2022　（Hangzhou） and 2026, the Tokyo 2020 Olympic Games and the next two Winter Olympics in Korea and China..., the sports calendar of Asia will be very busy with continental and international events." Organizers said in a presentation to the OCA assembly on Sunday that the Games would cost $842 million. The bid only received the green light from the Japanese Olympic Committee (JOC) earlier this month after the provision of detailed cost estimates. --The 18th Asian Games in Jakarta-Palembang, Indonesia, in 2018 will feature four of the five new sports accepted by the IOC for the Tokyo 2020 Olympic Games sports program. Baseball/softball, karate, skateboard and sport climbing will be included in the next Asian Games, but surfing was not added to the program because of a lack of suitable venues in the host cities. --The OCA approved the creation of regional offices in five zones: Delhi for south Asia; Almaty, Kazakhstan, for central Asia; Bangkok, Thailand, for southeast Asia; Kuwait for west Asia; Nansha, China, for east Asia.